This week I decided to look into some of the most sustainable or eco-friendly businesses. When conducting research, I found this Forbes article which gave a list dedicated to listing the most sustainable businesses (link is here). What I found interesting here is that when looking at the data they used to make this decision, aside from the company’s use of carbon, coal, and other non-renewable energies, they also looked at the diversity and ethicality of a company. Though this may not have a direct impact on the environment, I found it interesting that the researchers for this list decided to include this requirement. Another thing about this list is that there is only one food company listed: McCormick, which ranks #23 on this list. The majority of companies on this list tend to be ones which deal either with electronics and software or are companies which make components to be used. Aside from this, I decided to look into how much waste I am generating through my coffee drinking habits. After doing some research, I found one person who decided to go ahead and calculate how many cups Starbucks uses per year (link to their blog), and we can extrapolate from this that the majority of these cups are not being recycled. According to his calculations and the information derived from the data Starbucks provides about its consumer behavior, it was calculated that for the year of 2013, Starbucks used roughy 3 billion cups in its stores. Over the previous five years, this number would most likely have increased, and I do not want to think about how many of those cups are still decomposing. Personally, I feel that the most trouble for these things is the convenience. It’s so easy to just run into a coffee shop or order from a restaurant and get your things to go rather than bring your own and have to wash them out constantly and bring your reusable items wherever you go. However, after doing this research, I’d rather bring my own things than to continually contribute to the rapidly increasing about of single use items. As far as making a larger change, I believe it would be interesting to see what would happen if a cafe stopped offering single-use cups for a day. Obviously, there would need to be some inexpensive alternative available for those who forgot to bring a reusable cup. That being said, I also know that in the U.S., Europe, and Canada, Starbucks offers a reusable plastic cup for 1 US Dollar, or 6RMB. Often, if people choose to buy this cup, Starbucks will also have a special offer as well. These special offers most often include savings for customers when they bring in a cup or go so far as to receive free coffee when they bring in a cup for a month. Yet even will all these offers in place, people still rarely bring in their own reusable containers in order to favor convenience. When watching Bag It, I felt more aware of the amount of plastics we consume. Even though i was already conscious of how much plastic might be looming in the ocean I was surprised to see that most plastics are not recycled, or if they can be, they are simply just thrown out. I know recycling isn’t the only solution to the problem which stems from single-use plastics, but it could be something which could help to make products more reusable. Along with this, I didn’t know how harmful some of the chemicals in plastics were nor did I know how easily they could infiltrate our systems. Aside from chemicals, I also feel that one of the biggest problems with plastics is that they are used for everything. Especially in China, everything is either packaged in plastic or is wrapped in a plastic bag for convenience. If you order a bubble tea for example, the cup it is served in is plastic, but the plastic straw used to drink the tea is also wrapped in plastic; what’s even worse is if you decide to take your tea to go, most often it is wrapped in a small plastic bag, as if it is a huge inconvenience to carry a cup around. Also, almost all goods here are wrapped in plastic. In Family Mart, for example, nearly every single product you see has plastic packaging. As plastic is used on such a large scale, it means that we are constantly more and more to fulfill consumer demands, and to go without generating plastic waste would be nearly impossible. On a personal level, I feel that placing fees on plastic bags is just the beginning of an incredibly large movement. Yet, if we want to see change we are going to need to place bans on some single-use items or find small changes that everyone can make on an individual level. Once these changes are found, we would need to find a way to make this a norm for as many individuals as possible. Over the past week, I have begun to collect plastic trash to use for the art installation. I came to realize that many things have plastic or are packaged in plastic that really do not need to have it. Before watching the documentary, I didn’t realize that takeaway cups at Starbucks have a plastic lining, and that many different foods such as instant ramen, eggs, and vegetables are all packaged in plastic. Most of the time these objects also have extra packaging that they do not need to have, creating unnecessary waste. Also, when I went into Family Mart the other day, I noticed that nearly every single product there was made of plastic, or had extra unnecessary components. Personally, I think eliminating plastic currently will be very difficult, especially in certain regions, as many items utilize plastics. I know that different biodegradable fibers can be used to make packaging, but I also know that this can be more expensive and will then cause resistance between businesses and consumers. Therefore, I believe that if we are going to start decreasing the use of single-use plastics and finding a way to cut them out of our lives, we need to find sustainable alternatives that are accessible to people regardless of their financial situation. It has been an amazing journey. Initially, I proposed the idea of an attachable shoe bag because I myself experienced the inconvenience of carrying my gym shoes around a lot, and I was so glad that Mari also became interested and we could further develop the idea. I also feel so gratified to witness our little “babies” coming out. Mari and I made a great team as we are both self-motivated and we made equal contributions throughout the production process in different ways, such as I focus more on the practicality and Mari is more concerned with the appearance, and I was mainly in charge of Chinese conversations and she mainly English. We purchased quite a few items from Taobao and went through many comparisons and discussions. After we selected the final concept and used Tinkercad to sketch our first 3d model, Mari created an improved and polished version with Fusion 360. 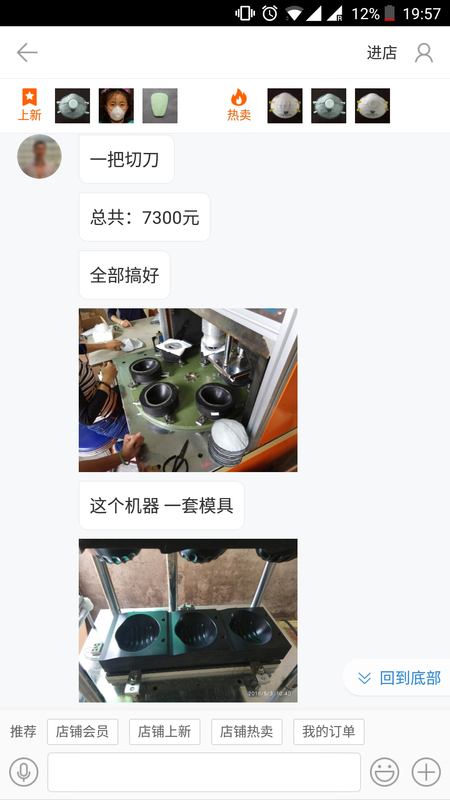 Meanwhile I started to contact vendors on Taobao in search of potential partners to outsource our design. The existence of Taobao is one of the greatest things about making in China because there is such a big variety we could refer to and for each item we pick, there are usually many other similar goods with more competitive prices or credibility so it’s very convenient to find the best deal. It is also one of the worst things because of the exact same reason. The market is very competitive and most vendors are doing small profit business, therefore it was really difficult to get them disclose any information on their sources and invest time in a partnership with us. After several attempts, we moved on to Alibaba. This time Mari was majorly in charge of the negotiations, and luckily we received many positive feedbacks and were able to narrow down on two factories in the end. We examined the samples they send us and decided to work solely with Roy. Mari passed the conversation with Roy to me because we thought talking Chinese would be more convenient for both of us. However, we later sensed Roy’s attitude became slightly sloppy, probably because we were using our mother languages and became less formal. One important skill we both learned from working on this project was how to communicate. 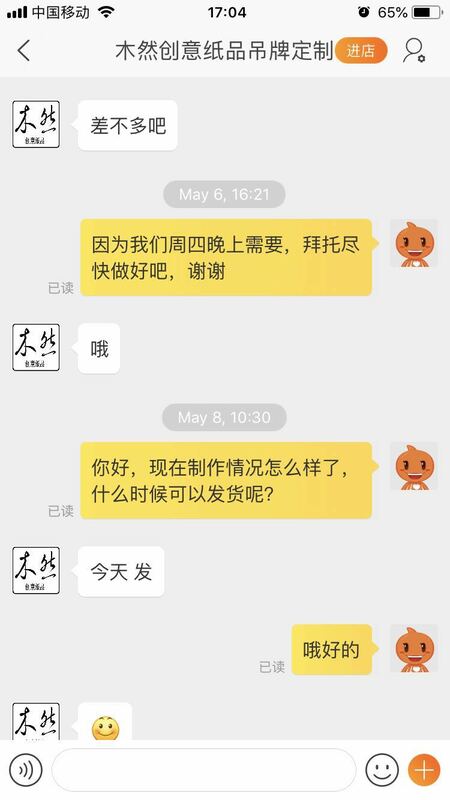 We practice drafting English messages/letters for Alibaba together, and I always explained and discussed with Mari about the Chinese conversations I had on Taobao or Wechat before responding. We found that although we had a rather clear idea in our mind, there could still be difficulties to realize it from time to time due to inefficient communication. I think it’s also because of the less formal way we’ve been communicating with our partners that sometimes we have to repeat and reassure that our messages come across. The journey isn’t over yet as the third batch of samples with 2 sizes to choose from and more ideal straps are on their way. I am looking forward to them! 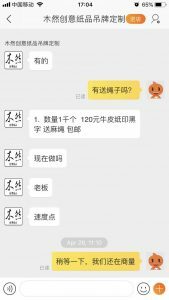 I used my experiences on shopping on taobao and dealing with customer service representatives in China to message representatives from the factories and identify what services they could specifically provide for me. 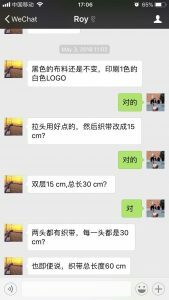 Due to taobao shopping, I expected these conversations to be fairly casual and with quick responses, however dealing with these factories, I was surprised at how easily it was to explain what I needed and wanted. 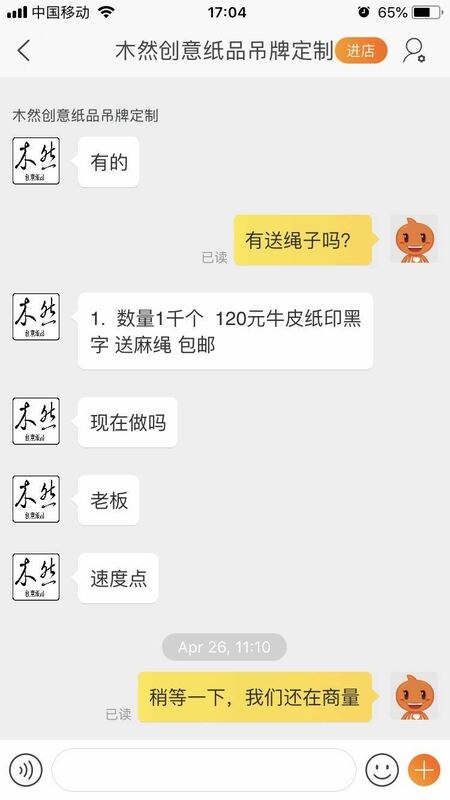 I messaged them using the in-app Alibaba chatting client and called the or added their wechat as necessary. They were all fairly accommodating and even went out of their way to help me, seemingly available at any hour. This was good for me because I found it difficult to set aside time for researching factories and manufacturers. Much of my interactions were brief, direct, and conducted while in a moving vehicle. I’m not sure how necessary this was for research, but with my limited Chinese skills, just reading the listing wasn’t enough to figure out what exactly the factory was selling. For this reason, I needed to talk with a representative. I always look forward to group work because I think it’s really important to learn to work well with others and I appreciate opportunities to practice. From working on this project, I was left confused and insecure about my approach to teamwork. At the same time I think I learned some things about myself that I hope I can apply or look for in later experiences. I think that this project suffered from a problem that Christian discussed earlier in the semester: one partner losing interest. It was difficult for me to determine exactly when I needed to give up on the idea of partnership and work on my own, while I realised at about halfway through the semester that I should treat this as a solo project, it wasn’t until after the Shenzhen trip that I fully accepted that I was the only one responsible for materializing the project. If I had been more self-aware, I should have known from around the time we were working on 3D models of our prototypes or perhaps earlier. We approached each assignment on a case by case basis, deciding how to divide the work when we received each assignment. 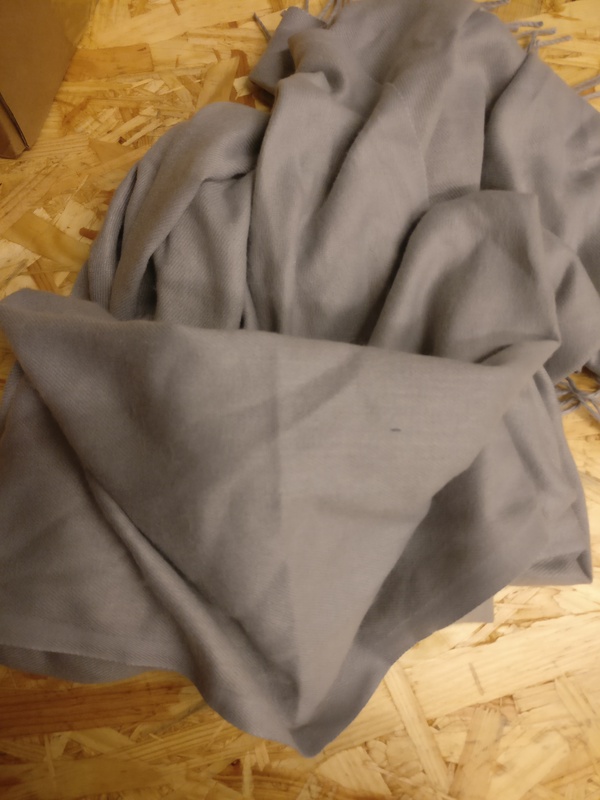 While it seemed to me there was an implicit assumption Dee would contribute greatly towards sourcing each material, I found and purchased every item except for the scarves. While this does not fit my ideal team project dynamic, I realised that I needed to be the one in a management role on the team. I needed identifying directions to pursue, clearly and meticulously assigning tasks to reach these goals, ensuring my instructions are clearly understood, and reminding/checking up on the status of these tasks. Not only was I responsible for holding myself accountable to make progress, but also for doing the same as my partner. This is also not my ideal management dynamic. I learned what I really needed from partner and what it takes to get a major project such as manufacturing a product to come to fruition. My individual working style, I’ve realised I struggle to balance major projects and must work one until completion at a time and circumstances at the time (attempting to finish two capstone projects along with other school work) the mental load of managing every individual aspect in this project was very high and made it difficult for me to clearly identify what I needed to put my energy towards to complete the active filtering scarf. I need a partner who can help carry the project and I can depend on to hold themselves accountable and balance out the work. Open communication was very important towards accomplishing this project. If something wasn’t explained well it wouldn’t get done. It also helped ease tension. I learned the importance of honest conversation and expectation setting. I hope to carry this knowledge and skills with me to whatever team and whichever roles I may find myself in the future. 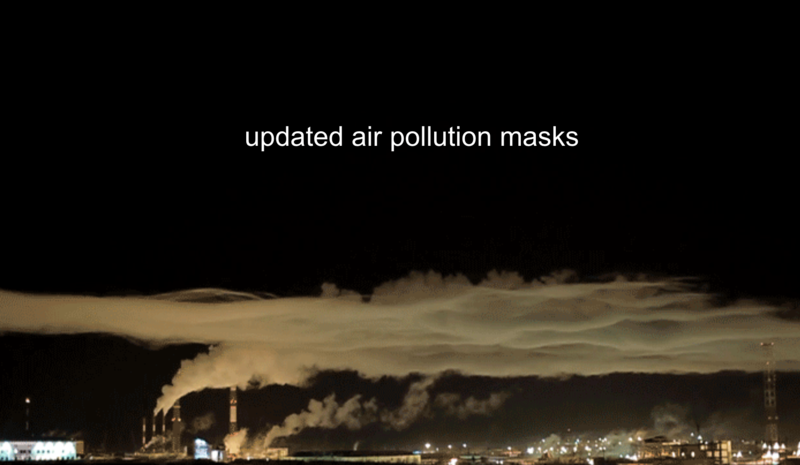 This product was inspired by a desire to improve the air pollution mask wearing experience. 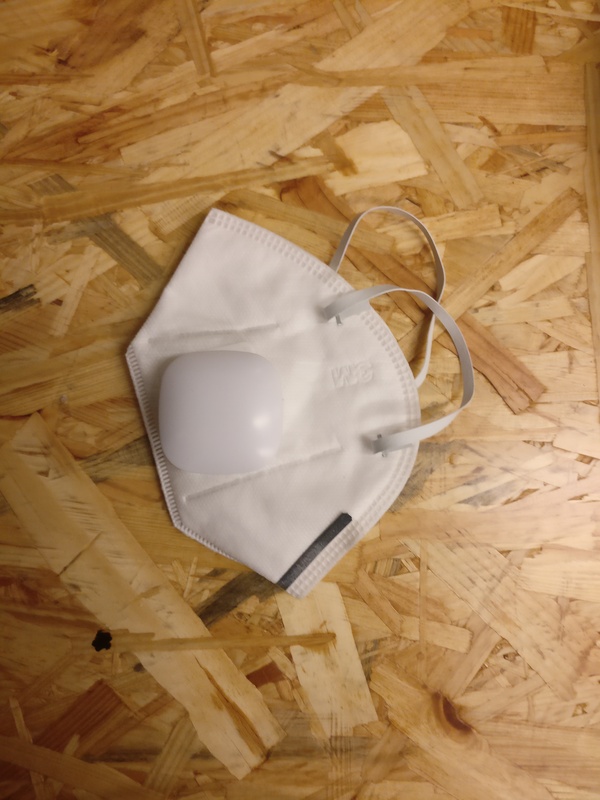 The goal was to create a tasteful product to make breathing comfortable and produced less environmental impact than traditional air pollution masks. Even as someone who is concerned with health and air quality, I often forget to bring my mask with me when I leave the house. However, in cold weather, I rarely forget my scarf. By combining the mask and scarf, the Active Filtering Scarf should solve this issue of forgetting a mask. The Active Filtering Mask is an air pollution mask hidden within a scarf to make the wearer appear more discrete while still protecting their health. 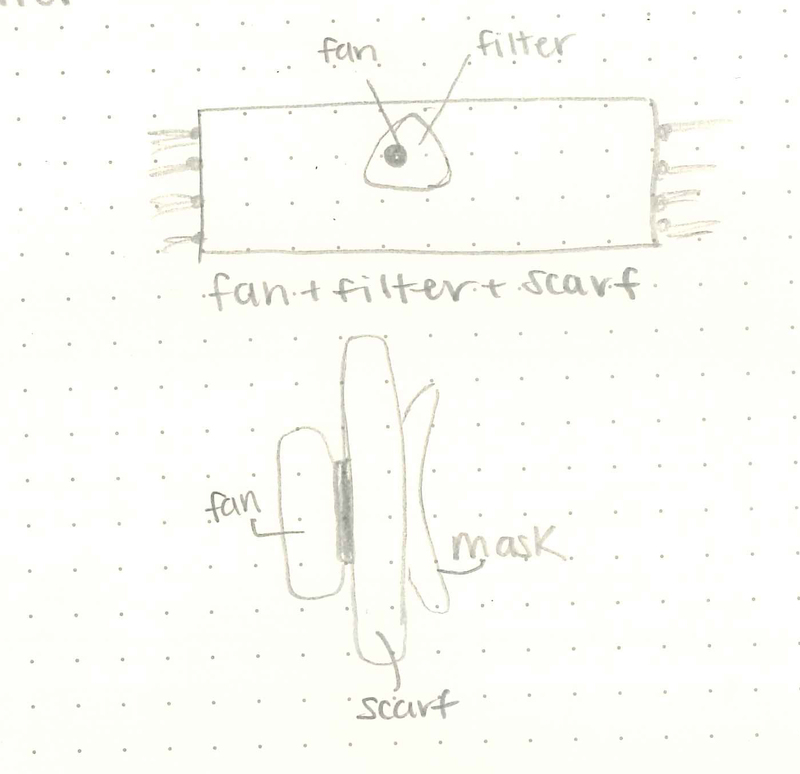 By implementing a fan into the mask and scarf combination, the fan helps air flow with less restraint. The only disposable component part of the product is the filter, which should be changed frequently to ensure that air is filtering properly. 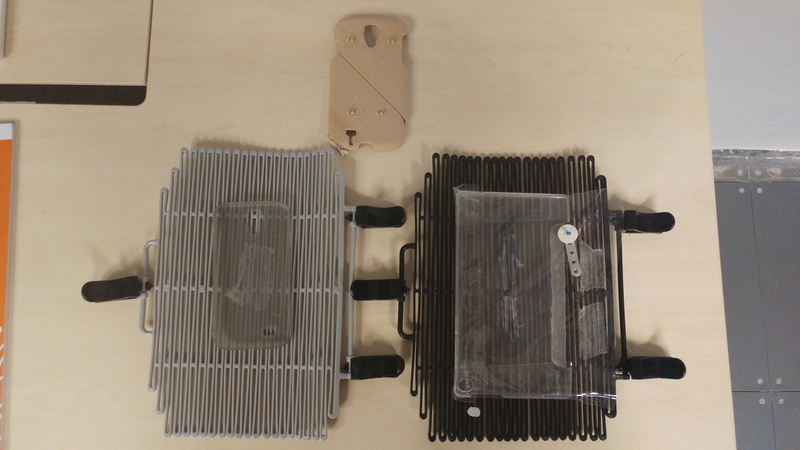 The valve for the fan will be encouraged to be removed and reused on new filters, but some filters will be sold with the valves already attached. 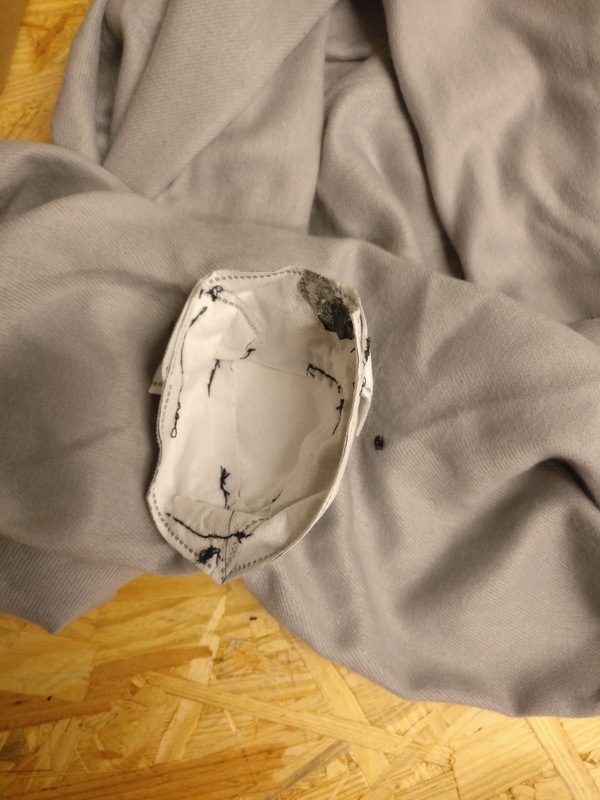 Along with the filter, the snap buttons that fix the mask to the scarf will be thrown out with the fan. The rest of the materials, scarf, fan, elastic, half of the snap buttons, can all be re-used, which reduces the consumer’s waste. Click the image to see the Google sheet with the BOM. The two main and fundamental suppliers for this project are the fan/valve suppliers and the mask supplier. The fan supplier is an OEM manufacturer, 深圳市风恒科技有限公司, based in Shenzhen. They can help us put a logo on the fan and also with the assembly of the fan/valve and mask. 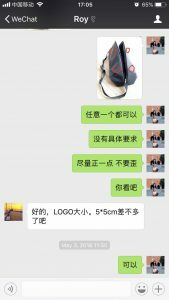 The mask supplier, 东莞市马斯奥防护科技有限公司, is based in Dongguang. They can help us create a new mask shape by creating a mould and for the mask. To create a new mould, it would require about 7000 RMB and 14 days. The rest of the suppliers are the fabric market, but could also be found online. The cashmere scarf was something that Dee found. I really liked the way it felt, so we decided to go with this particular scarf. It could be exchanged out for a different type of fabric. Initially, there were a few different concepts around clean air with a comfortable, aesthetically appealing experience. The first and most basic involved a removable PM2.5 filter and a scarf. Responsibility for creating the seal falls on the wearer. The direction built upon the first concept, but with active filtering. 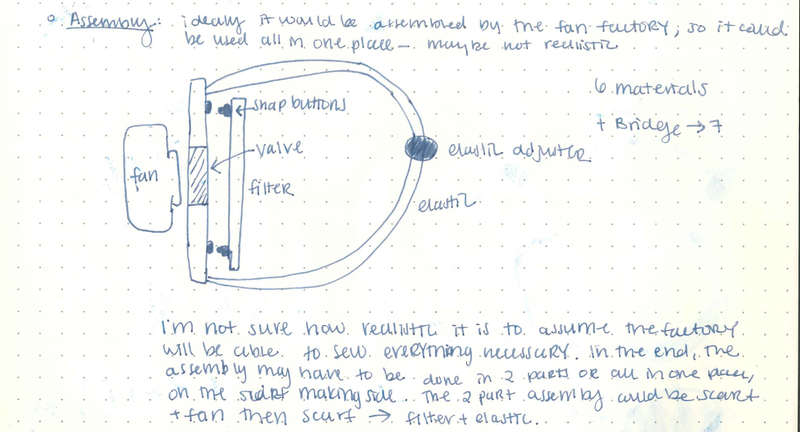 The removable filter became a structured mask with a fan attached to aid airflow. Lastly, the final concept was directed at pet owners and their pets. 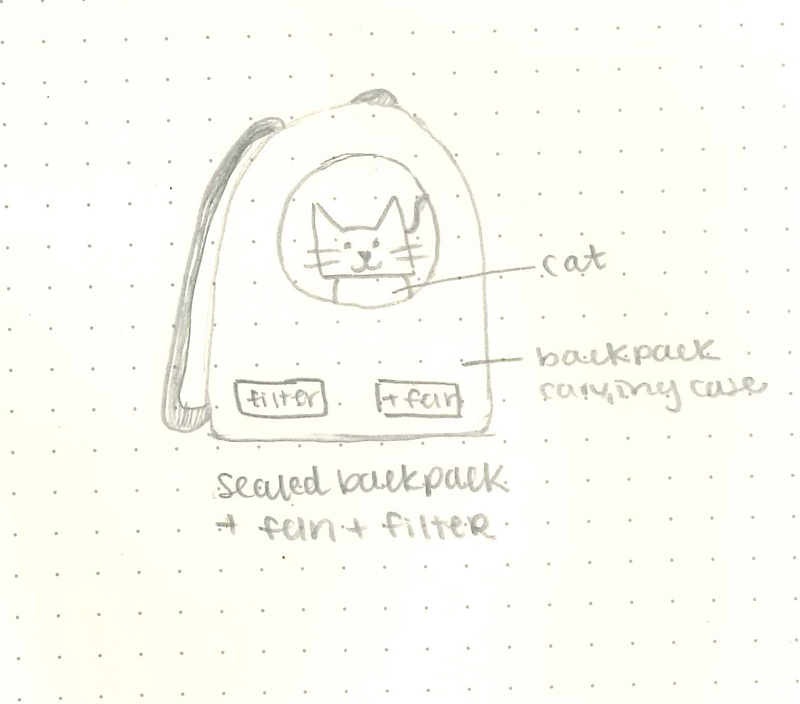 Technology similar to the active filtering scarf would be implemented into a pet’s carrying case for a pet. Armed with the information and experiences from the functions-like prototype, I had a clearer idea of the design and materials needed for the functions-like prototype. After receiving some samples of fans and valves from the OEM manufacturer, I was able to verify that these could be included in the mask and scarf materials. I assembled the active filtering scarf with the fan and valve connected to the scarf. The filter attaches to the scarf with snap buttons for easy removal and disposal. The scarf can be held in place with two adjustable elastic bands. The active filtering scarf was designed for sustainability, so the only disposable product is the filter material and metal snap buttons. After testing the functions-like prototype, I discovered a problem with air flow that needed to be addressed before going into the manufacturing process. This prototype is the final prototype before manufacturing. It builds upon all the findings from the previous scarves. This prototype implements a smaller more fitted mask. For a discrete use, a portion of the scarf material made available to cover the fan. Still designed with sustainability in mind, the valve can be removed so that only the filter and snap buttons are disposable. For ease of use for the customer, Filters with the valve attached, are also available for sale in addition to valve-less filters. Unfortunately, due to budget and time limitations, I was not able to manufacture the custom mask shape. To source the materials needed, I searched extensively for the correct manufactures and developed relationships with factories important to this product. The mask manufacturer I found would create a mould then manufacture custom made masks and the fan manufacturer would assemble the scarf. 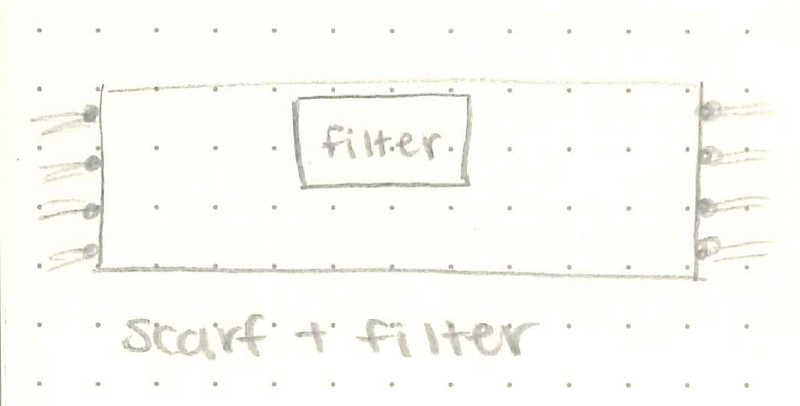 Now I understand the specific services that each factory would provide for me in the event that I wanted to manufacture the active filtering scarf. Click the photo to see the full presentation. Presenting the idea to the class was a good experience. It helped me feel validated that this was worth persuing and they provided some interesting ideas that I hadn’t considered before, one being a fan to place in the mask the fan would help air flow. 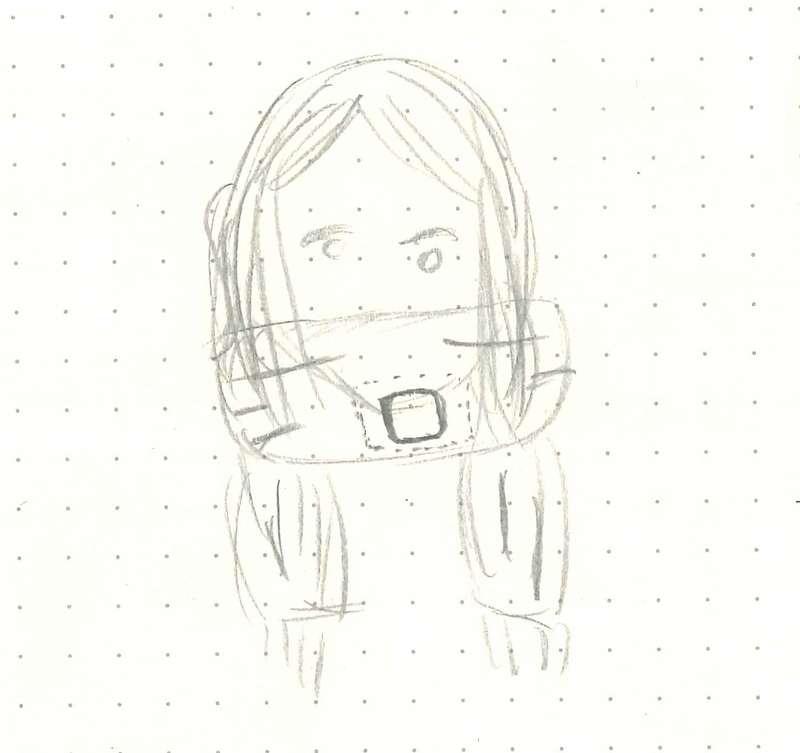 The second would be to hide the mask inside a scarf which would allow the wearer to protect their lungs in a more discrete way. I’m not sure how realistic it is to assume the factory will be able to sew everything necessary. In the end, the assembly may have to be done in two parts or all in one place on the scarf making side. The two-part assembly would be scarf and fan then scarf to filter and elastic. From my perception of sustainability, it has always been about creating a product and running a company as efficiently as possible. I think the tradeoff through is that sustainability requires a lot of up font thinking, design, and costs that may not seem worth it or too overwhelming at the beginning. However, if one can think in the long term (long term may even mean generations from now) to produce and function sustainability is more cost effective in the long run. Employee retention/happiness means you don’t have to waste time and money training new hires. In addition, employees may take less pay for a better working experience. Keeping customers happy means repeat customers who will advocate to their friends and peers. To use sustainable energy and resources ensure es the company could have a feature. Optimizing the supply chain and design will also keep costs lower. As a business student, I have learnt the concept of “design thinking” in my freshman cohort class. I remembered we had a few brainstorming sessions for ideas to improve sustainability in NYU, but the furthest we got was to “pitch” our ideas to the class and maybe adding one or two pictures of the “prototype” to the slides. More than a year later, I enrolled in this “Made in China” course because I wanted to understand how the ecosystem of the creative industry worked in China. Unlike the previous class, it sounded really cool that I could design my own project and get it manufactured, but not simply “talking on paper”. Looking back at these past 14 weeks, it was definitely not an easy process. At a certain point during the course, I was pretty discouraged as things did not go as planned and I worried that I could not produce anything meaningful. However, I am so glad that I made it to the end and I was really surprised that there were few students and guests who were actually interested in buying my prototype. I am not only thrilled about my accomplishment, but am also wondering whether I want to be an entrepreneur and build a start-up in China after graduation as the course has sparked my interest in “making” something. From the original ice cube tray concept to the beta prototype of the Bike Pad, I realize the value of my “idea” was not about all the fancy functions that I came up with, but the opportunity identified that motivated me to keep finding creative solutions through aligning my thoughts to what my customers think. I and Bruce had constructed so many different kinds of prototypes, including low-rez prototypes, looks-like prototypes, works-like prototypes and engineering prototypes. Although each prototype looks really different than the rest and not one of them is perfect, they all give me some new insights on how my ideal solution should be like. On the other hand, the most important takeaway from this course is of course directly experiencing the “made in China” ecosystem. In particular, I had the negative perception that “Made in China” equaled “shanzhai” before this semester. Through examining the product cycle in class and visiting factories to talk directly to the people in the industry, I now strongly believe the Chinese manufacturing industry had both hard and soft skills, which means they have the capabilities to produce high-quality products and services with high efficiency. After all, China is gradually moving up the value chain and is providing comprehensive supports for entrepreneurs to conceptualize their ideas and engage in the production processes. As for working with Bruce, I believe our division of work is pretty natural. As an IMA senior, Bruce is more familiar with utilizing technology tools in modeling and has much more experiences with hardware designs. Therefore, he tried really hard to produce multiple high-quality 3D rendering models and coordinated the 3D printing processes, which are very important for us to visualize our concepts and evaluate their feasibility. He also showed me how to use various tools available in the IMA lab to do rapid-prototyping, which I think was one of the most important processes that we went through before we had our final design. Meanwhile, I was more responsible for the “business” side of the project. I was always planning our next steps, collecting feedback for the product and making sure we had everything we need for the next stage and were meeting all the deadlines as I knew it took some time to develop nice-looking models using technology. Sometimes I might have annoyed Bruce by always proposing new ideas that might sound completely irrelevant to the project as I believe we should not waste our time on improving ideas that were unlikely to succeed. This was why I suggested adding a “phone case” function when the “basket in a basket” idea didn’t work out and to use “L”-shaped hooks instead of circular-shaped hooks that could easily break. I do believe that I have demonstrated him the importance of being flexible and always have some backup plans in case things didn’t go as expected. Overall, we had a great time working with each other and we were both delighted to see our products finally came into shape after numerous re-designs. Over the course of these 14 weeks, I have definitely learned a lot about China’s manufacturing process. 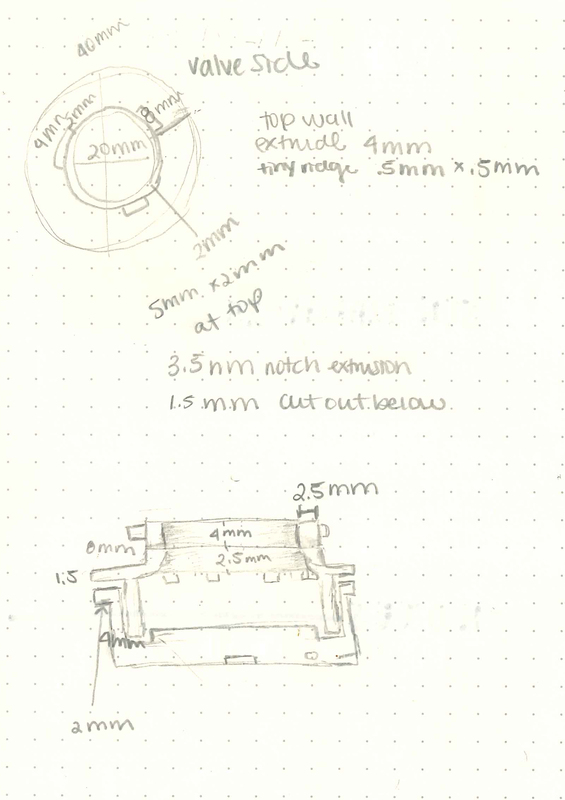 The course originally seemed to be focused on electronics, which influenced my original project proposal, but I actually feel that working on a simple consumer product was better for understanding the fundamentals of this process. Electronics require many extra steps (e.g. PCB printing, surface mounting components, etc.) that would have made the process much more confusing, especially for people without my background. By working on simple products the task became less about designing circuits (very electronics specific) and more about how to bring any given design from idea to realized product. At the beginning of the course I thought that an entire product was manufactured from raw components all in a single lab. Probably the biggest thing I learned about how manufacturing is done is how companies use Original Equipment Manufacturing to take existing products and put them together or modify them to create new products. This is closely related to the supply chain, which feeds into the BIll Of Materials (another important concept I learned). Another characteristic of Chinese manufacturing is the speed of prototyping and design, which Christian emphasized and we experienced firsthand but is hard to grasp without much understanding of the speed of the western manufacturing cycle. Working with Linda had good and bad consequences. Both of us wanted to design a perfect product before moving on to manufacturing, which left us a bit behind in the process. I handled the engineering considerations, particularly the electronics for the early conceptions of the cane, while Linda worked on the aesthetics and took care of things like 3D modeling. This division of tasks actually worked fairly well. During our ideation we were able to go back and forth trying to balance grand ideas with feasibility until we came to a design we both liked. This was particularly good for me, because I usually don’t care so much about how things look; as long as it does what it is supposed to do I leave the aesthetics as secondary. Having Linda’s input to keep this as a priority was especially good for a product that could one day go to real consumers. It helped break the tinker trend of IMA and moved us closer to a realistic product that would be manufactured in China. As for Linda, I’d like to think I helped her learn to have some idea of how the parts of a project come together before commiting to a design. There were many ideas we had that simply weren’t going to work with our budget, timeframe, and expertise, and taking a moment to consider the logistics of those ideas carefully can save a lot of time that would be wasted on impractical designs. We think that commuters who rely on bikes to go to work or school but are not making use of the front bike basket to hold their accessories. We see an opportunity to design an add-on to the basket in order to prevent accessories inside the basket from falling off. We think that commuters who rely on bikes to go to work or school are sometimes only using one hand to bike as he is using another hand to hold his phone which helps him to navigate the way. We see an opportunity to design a phone holder to the basket in order to allow the commuter to read the phone hands-free while biking. The Bike Pad is a multi-purpose add-on to any sharing bikes that helps users in 2 ways: Firstly, the bottom lid can be attached to the top of the front basket of any sharing bikes and keeps the groceries inside from bouncing off. 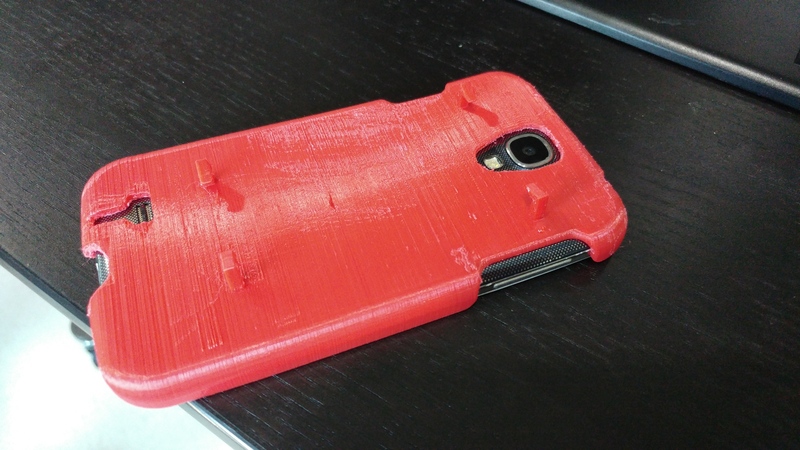 Secondly, the phone case can be easily attached to the bottom lid with the unique snap-fit design and hold the biker’s smartphone securely for convenience in navigating and music-playing. As the product is made of plastic, It will also be light and portable. Users will be able to customize the product to fit different models of the phone. After Week 8, we have decided that we will not need a collapsible function, so the entire design shifted from being a “basket in a basket” to an add-on to the bike. 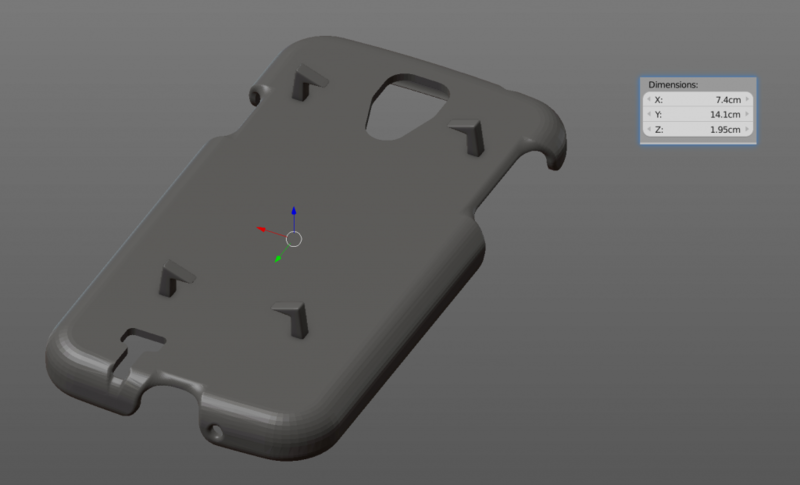 After consulting with industrial designer Arlen, we think we may want to design an attachable elastic plastic/silicon case with a transparent film on top to hold the phone in place. Nonetheless, we realize the design is not feasible as we need to utilize plastic injection which is very expensive and requires at least few weeks to few months for the manufacturer to produce a mould. Therefore, we again switched to a design that makes adjustments to existing products. The cover/lid that we bought from Taobao is helpful in preventing the stuff from bouncing off, so our idea is to add an attachable phone case on top. 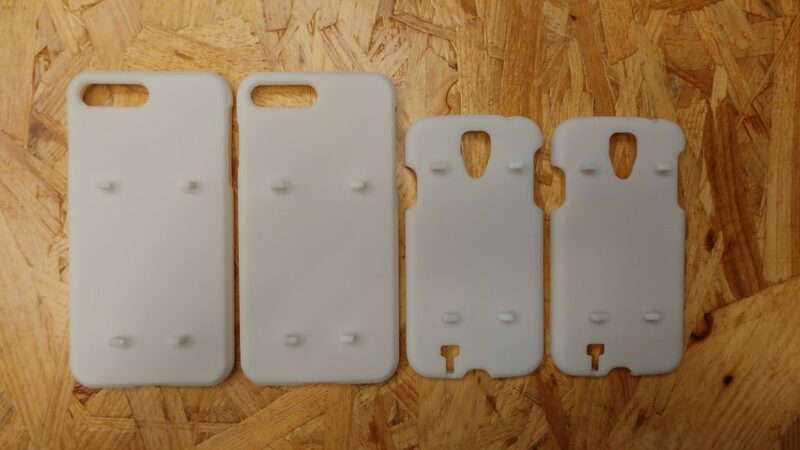 After few trials and errors, we finally come up with the snap-fit designs that are easy to use and strong. How we made our physical prototypes? 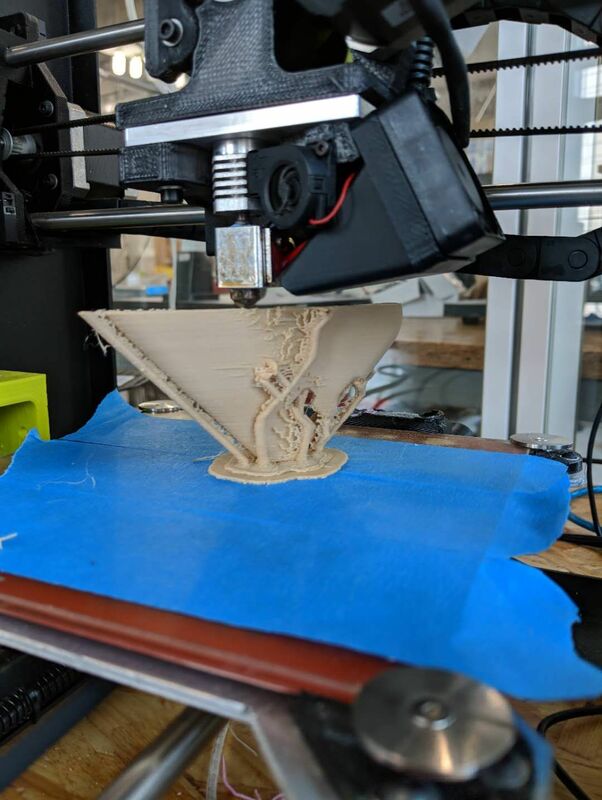 3D printing! 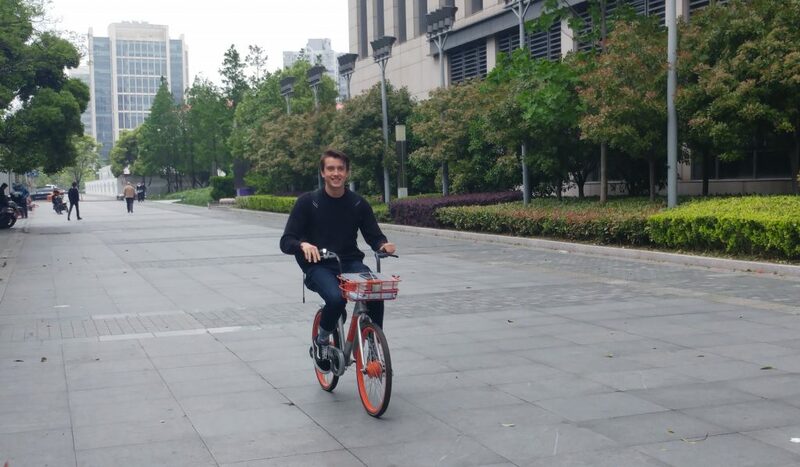 We also conducted a prototype testing session with few classmates who use sharing bikes frequently. They all expressed interest in the product as the product will be helpful for them. They suggested us to remove the film as there would be glares, and tell us that it will be cool if users can decide where to put their phone on the lid. Therefore, our final product is designed based on their recommendations. We had our initial design, but we were not sure if the product we designed could be mass manufactured. Arlen is the product design expert Rudi introduced to us. 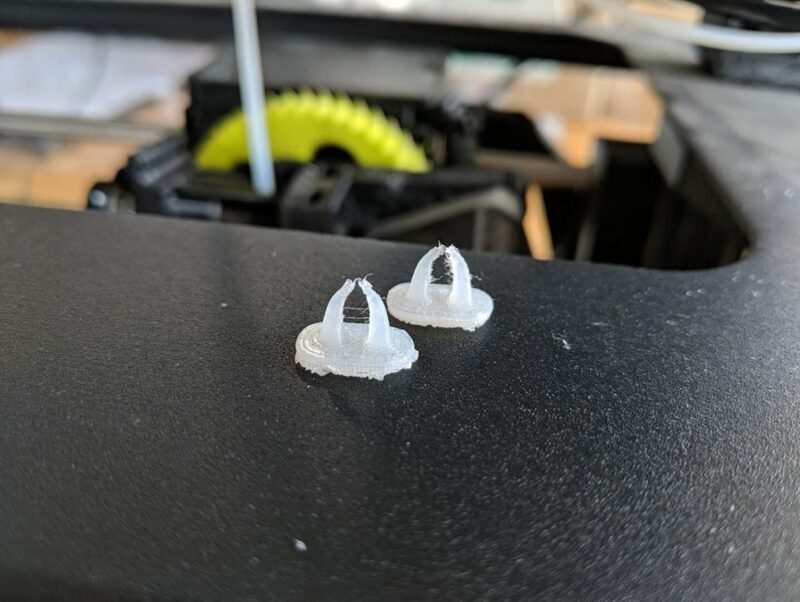 We asked if our design with TPU and other plastic could be made, he gave us some suggestions about choosing the right technology, as well as helping us come up with a few alternatives that could also accomplish our goal, while saving material and simplifying the assembly process. After we have prepared the rendered files for our product, we planned to send them to a vendor on Taobao to 3D-print our beta prototypes. I was worried and a little bit anxious at first as I was not sure how the communication would work. It may sound stupid, but I did spend some time refreshing the page until I realize I have to first download AliWangWang to directly connect with the vendor after clicking the “connect” button. To my surprise, the vendor was very responsive and replied 15s after I sent the first message. 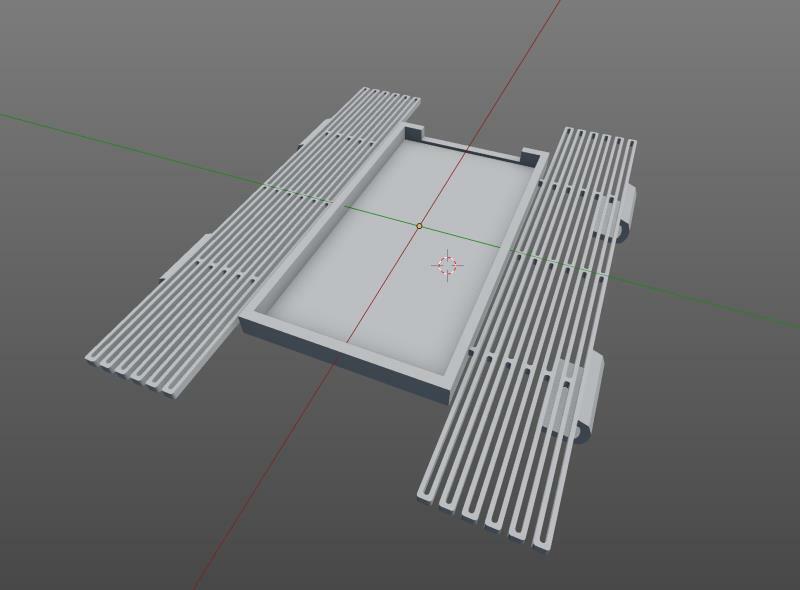 The process was actually pretty quick: I sent them my file, told them I need 2 units for each case and specified that I want ABS as materials. 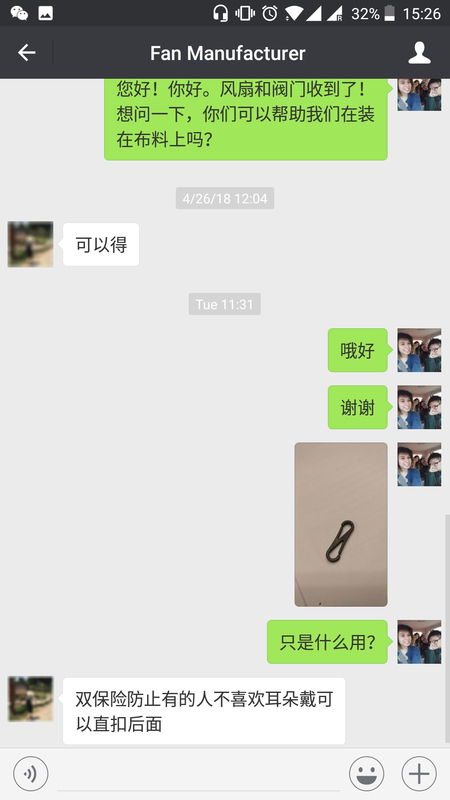 He confirmed the dimensions with me, made a sample photo and reported the price. 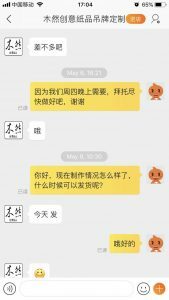 Once I sent him the school address and paid through Alipay, the deal was closed and the product arrived in the mailbox 3 days after. I was very amazed by the ecosystem that China has created. 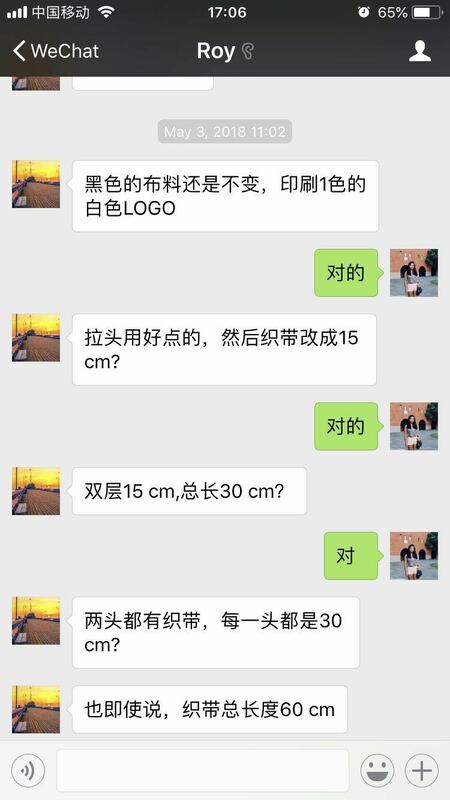 I thought Taobao is just like Amazon as they only sell consumer products, but I realize it is also a platform that provides “professional services” and connects designers to experts. From its high efficiency, high-quality products and welcoming attitude, I finally understand why designers like to bring their products to China for further development. Although we did not intentionally incorporate design features that concerns sustainability in our product, we believe our product will be durable and not easy to break. It is not likely to be a hazard for the environment. 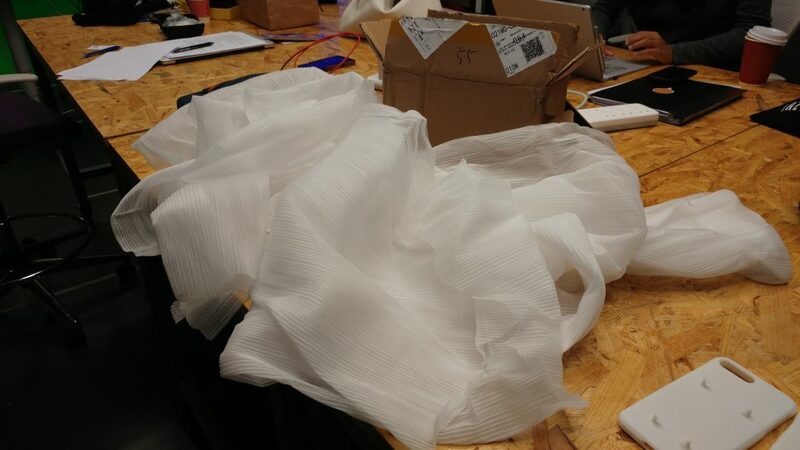 However, packaging may be the biggest concern to sustainability for our case since we notice that the 3D printer vendor used a lot of foam to send the prototypes to us. 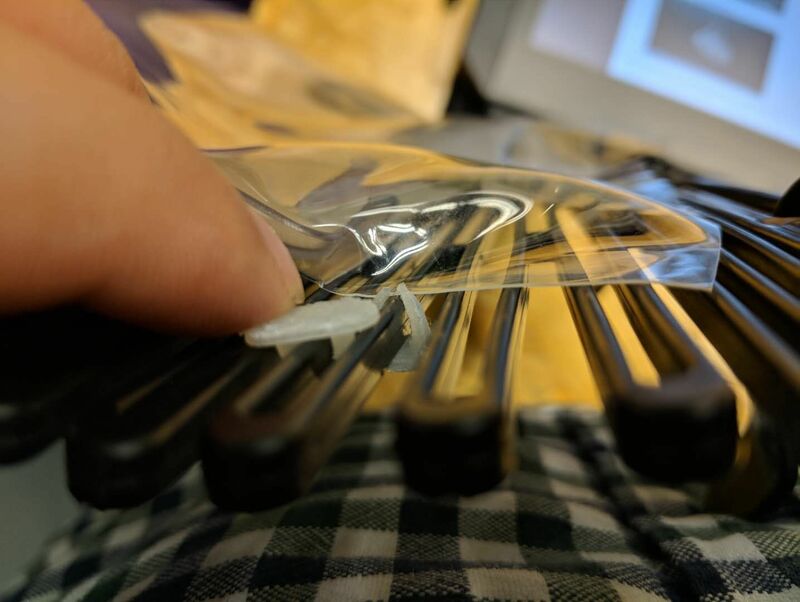 If the product is ever going to be commercialized, we will need to carefully choose the packaging that protects the snap-fit hooks from breaking while being environmentally friendly. 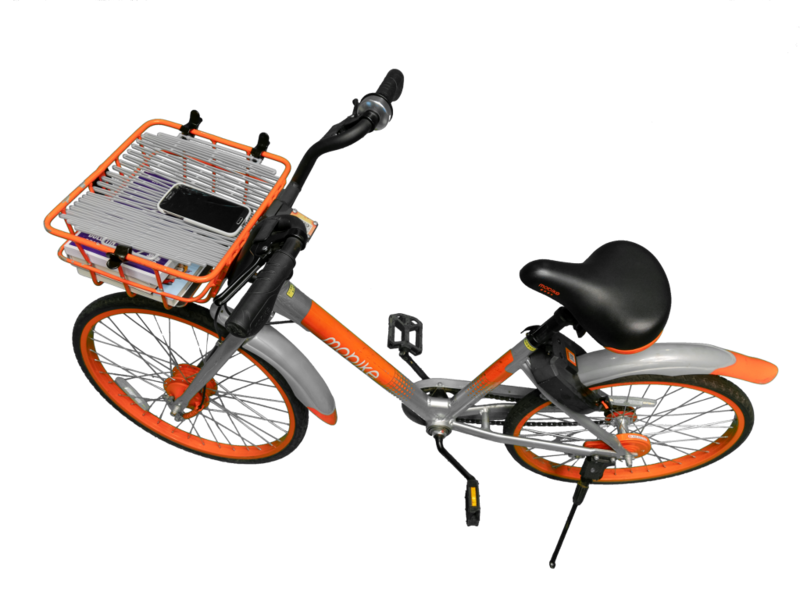 During the showcase, many sharing bike users expressed interest in our product and asked whether it was available for sale. We originally thought if we really want to commercialize our idea, we would need to connect with Japanese supplier of the elastic lid to customize it or simply design a new idea that can be mass produced through plastic injection and modeling. However, some of the guests suggest we can already put the existing products on Taobao and consumers will definitely be interested with correct marketing. 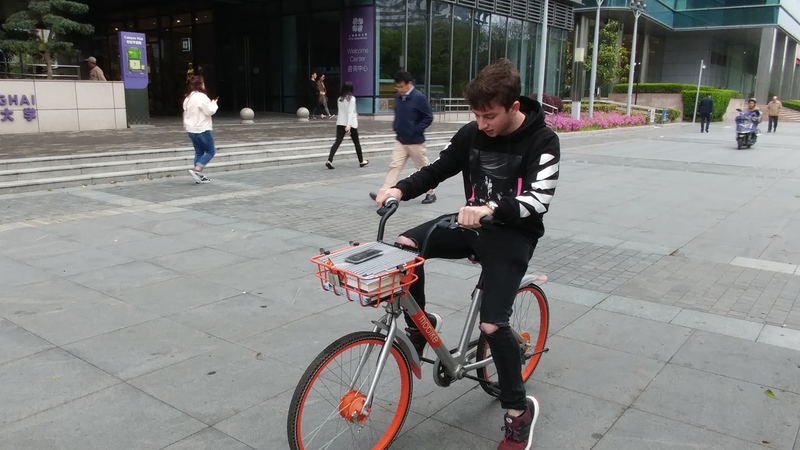 Although what can be done after this beta prototype will be out of the scope of the class, we are glad that people like our idea and believe it is an innovative solution to the problem that they face every time when they need to use the sharing bikes.